We provide a broad range of Single Burner Range, which carries a lustrous look and is appreciated for its optimum quality, durability & anti crack features. Available in different shapes and sizes, it is easy to clean and maintain. To lift this pot in an easy and convenient manner, it is also provided with easy grip handles. Moreover, we also provide our range of Stock Pot in customized forms. It is manufactured using high grade raw material to ensure fine finish and durability. Single Burner Range offered comes in durable construction finish and feature top panel and side panel material of stainless steel. Further, the burners used comprises electrophoresis cast iron burner with acid-washed brass cap. 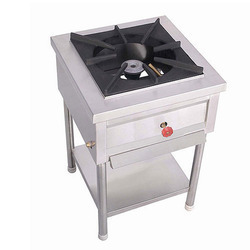 Other than this, this single burner comes with enamelled pan support with optional safety device. Some of its features include option of different ignition choice; suitable for use in homes, canteens and other areas; provide for reliable performance; can also be developed in OEM configurations as demanded from us. Looking for Single Burner Range ?